When the Blackberry Bold entered the smartphone market last year, it set the hearts of smartphone lovers everywhere a-racing. It was without a doubt a fine, fine piece of mobile phone apparatus. According to the blogosphere, the Bold has been subjected to a luxuriously stylish makeover. 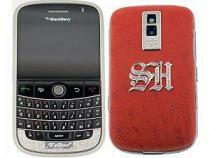 Called the Tellor, the luxury edition of the Blackberry Bold is the epitome of a lavish handset – outlandish animal hide and blingtastic covers with 205 diamonds underneath the keypad. You get to really show off your eccentric side too by opting for lizard, alligator, ostrich and stingray (yes stingray) skins – no wonder they’re limited edition. Based on that extravagant list, it’s clear this isn’t going to be a phone for the thrifty… or the not so thrifty for that matter. As with most limited edition anythings, there is a limited amount available, which in this case is 50. There’s no word on price either (refer to the previous sentence for my views on that). Who&apos;s Blackberry 8820 is making their celebrity owner gurn?